The older I get the more I like to host parties at my house. I love having groups of friends and family over for a good cookout or game night. But if I'm not the Hostess of the gathering, I've been trying to get into the habit of bringing a gift to whoever is. I only have 2 rules that I use when I'm picking out a gift of this kind; 1) make it practical & 2) wrap it up nice. I have chosen 3 different practical gifts to give to the Host(ess) at your 4th Of July party this year. This gift is perfect because it doesn't take up a lot of space and it's always helpful. I bought Americana inspired ones at our local dollar store, Keegstras. For such a low cost, you could buy several! Then I rolled them up and added a tag and bow. Boom, 5 minutes and you're done! I know a lot of people bring wine as gifts to parties, but can we just give a quick shout out to wine's less classy brother? K, good. Class up your gift by bringing a local beer, or go even more over the top with a mead or a cider. If you don't want to bring something local, just maybe steer clear of a 30 case of Labatt Light. ;) I grabbed this 6 pack at Aldi, added a tag and served up a delicious gift! Ah yes, the tried and true Host(ess) staple. It's hard for me to know what kind of wine is the best gift. I mean, people like so many different things! I stuck with something I loved, that way if they asked about it I could talk about what made it delicious. Seems like a safe route, right? I wrapped the wine 2 different ways. # 1; add a tag and a bow. Done. 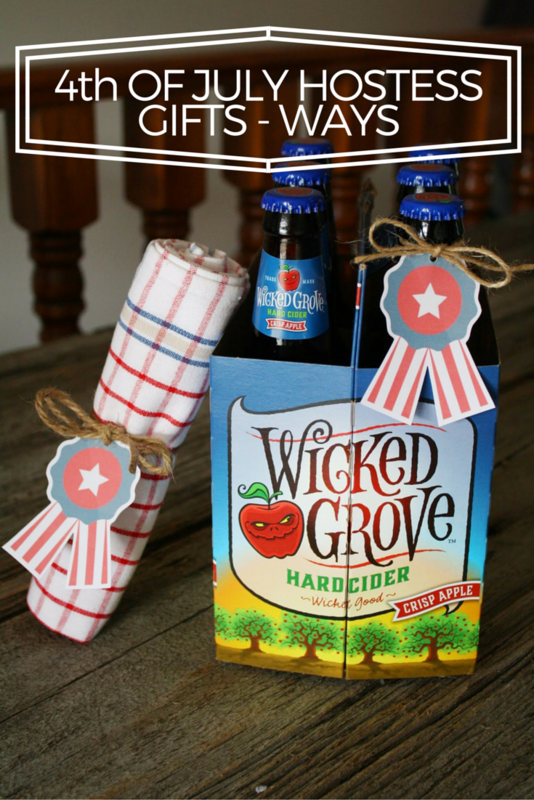 # 2; wrap the kitchen towel around the bottle and secure with twine and add a tag! What's your favorite of these 3 ideas? I think I'm partial to the kitchen towel, only because I'M ALWAYS IN NEED OF NEW KITCHEN TOWELS! What about you guys? Do you bring gifts for the Host(ess)? I would love to know what your staple is! First Tigers Game of the Season!